Barry II born April 1982. Andrea born August 1984. Just became a grandfather May 11, 2009! Barry Jacobs has a birthday today. Me on the right, Jade & son Barry to the left at his wedding reception. Daughter Andrea with her husband Jason on their honeymoon. 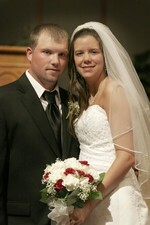 Son Barry and daughter in-law Amber. Barry and Amber's first child, our first grandchild, Riley Nicole. Born on Jade's Birthday! (A few years later of course ) May 11, 2009. Me with baby Riley, not even 24 hours old.